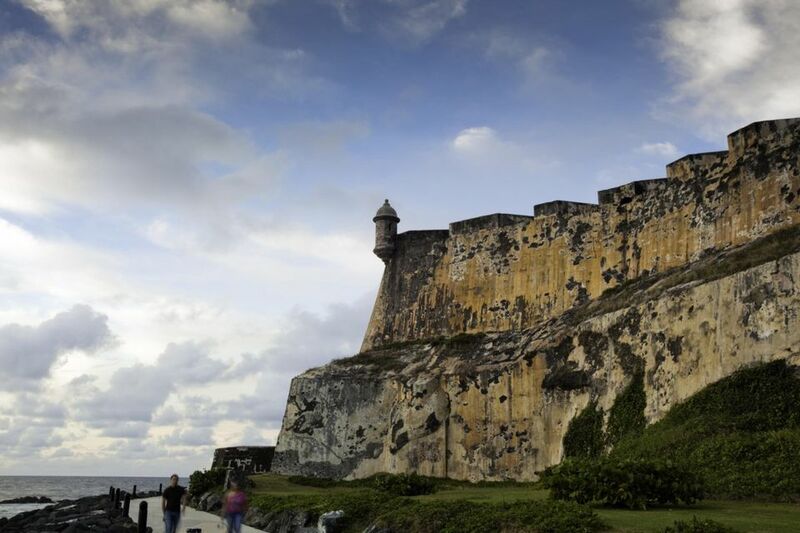 First-time visitors to Old San Juan simply cannot leave without visiting El Morro. The fortress is one of the most impressive structures on the island, encapsulating Puerto Rico’s role as a guardian of the New World. Within these walls, you can feel the awesome power this bastion of defense once commanded, and you can bear witness to nearly 500 years of military history that began with the Spanish conquistadores and ended with World War II. El Morro, which was designated a UNESCO World Heritage Site in 1983, is Puerto Rico's most picturesque military structure. The Spanish began construction in 1539, and it took more than 200 years to complete. This intimidating fortress successfully blocked England's Sir Francis Drake, noted for his naval aggression, in 1595, and a naval attack never succeeded in breaching its walls in its entire history. El Morro fell only once, when England's Geroge Clifford, Earl of Cumberland, took the fortress by land in 1598. Its usefulness continued into the 20th century when it was used by the United States during World War II to track the movements of German submarines in the Caribbean. Its full name is El Castillo de San Felipe del Morro, but it is better known as El Morro, which means promontory. Perched on the northwestern-most point of Old San Juan, this daunting citadel must have been an intimidating sight to enemy ships. You’ll follow in the Earl of Cumberland's footsteps as you cross a large green field to get to the fort. It is a bit of a walk to get to it, and you'll need to be able to climb steps and steep slopes. Wear comfortable shoes, use sunscreen, and bring bottled water no matter what time of year you visit. Once you reach the citadel, take your time to explore its ingenious architecture. El Morro is made up of six staggered levels, incorporating dungeons, barracks, passageways, and storerooms. Walk along its ramparts, where cannons still face the ocean, and step inside one of the domed garitas, or sentry boxes, which are themselves an iconic symbol of Puerto Rico. The garitas are the prime places to find breathtaking ocean views. Looking out across the bay, you'll see another, smaller fortification. Called El Canuelo, this was El Morro’s partner in the island’s defense: Ships hoping to attack Puerto Rico would be cut down in a barrage of crisscrossing cannon fire. Two modern structures were added to El Morro after Puerto Rico was ceded to the United States by Spain in 1898 as a result of the Spanish-American War. A lighthouse, which was repaired by the U.S. from 1906 to 1908, stands out in stark contrast to the rest of the structure. During World War II, the U.S. Army added another entirely incongruous fortification, installing a military bunker on the top level.